Discover the quirky craft that’s transforming Singapore’s landscape one yarn bomb at a time. Armed with a ‘paintbrush’, graphic illustrator and artist Kelly Lim, 25, added strokes and swirls of color to her ‘canvas’ at the Pondok (hut in Malay) before the Malay Heritage Centre. Unlike other artists, she doesn’t require a palette or paint and her masterpieces don’t sit in a museum. Instead, her ‘canvas’ is the physical environment and her ‘paintbrush’ is a crochet needle she uses for yarn bombing. Yarn bombing is the art of covering physical items with yarn. This worldwide phenomenon originated in Texas in 2005 with textile artist, Magda Sayeg. The craze hit our shores when a group of local crochet enthusiasts established the Yarn Bombing Singapore community in 2014 and creations by local yarn bombers, Ms Kelly Lim, Ms Suryani Binte Md Yusup and Ms Lim Shu Ning have been popping up in multiple locations in Singapore since. Known for her whimsical style, Kelly describes a yarn bomber as “a friendly terrorist, going to do something fun”. Often, she loiters and glances around a spot before placing her colorful creations out in the public. The artist vividly recalls her first yarn bombing experience in 2013. Donning a surgical mask to conceal her identity, she cautiously weaved a Pokémon hat on a bronze statue along the Singapore River. “I felt so kan cheong (anxious in Cantonese). There’s this thrill you’ll be doing something rebellious,” she recounted. Although her ‘graffiti’ yarn bombs are usually removed by the public within a day, her excitement of transforming a familiar landscape has not died. Over the years, various organizations such as the Urban Redevelopment Authority have approached Kelly, granting her permission to transform their sites. Recently, Kelly was invited to yarn bomb 3 heritage sites – Sun Yat Sen Nanyang Memorial Hall, Malay Heritage Centre and Indian Heritage Centre – in conjunction with NHB’s upcoming “Children’s Season 2017”. Preparing for the installations was no easy feat. Designing the pieces took 2 months, countless site visits, 22kg worth of yarn and a pair of very sore hands. Reflecting on the yarn bombs created for the Malay Heritage Centre, Kelly explained that she drew inspiration from the vibrant colors of Batik paintings as well as the floral and leaf motifs in Malay culture. Another member of Yarn Bombing Singapore, private tutor Ms Suryani, 38, enjoys collaborating with other yarn bombers. She actively engages in projects and monthly workshops by the group. The group which started out with several members on their first project now has over 1,060 members and has since worked on large-scale projects. 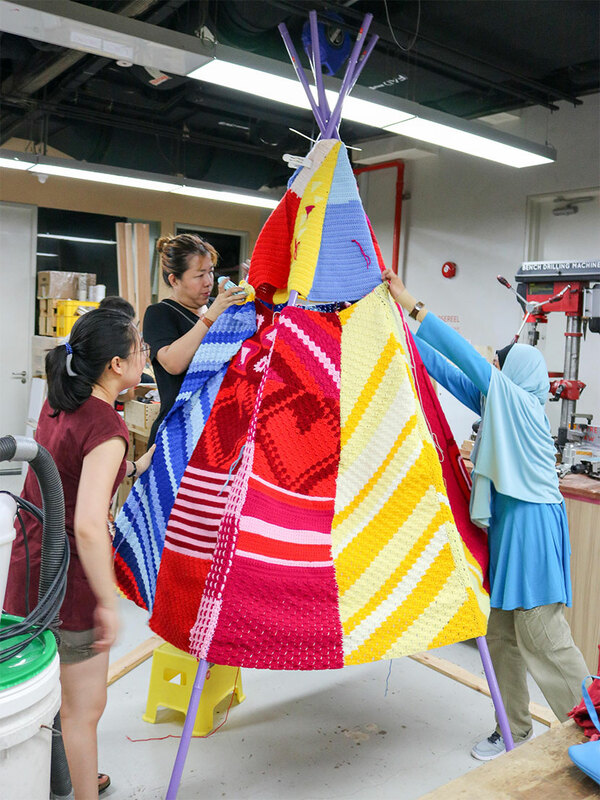 Their latest project, a multi-colored Teepee, standing at 6.5 feet tall, was displayed at Singapore Makers’ Faire on Jul 22. 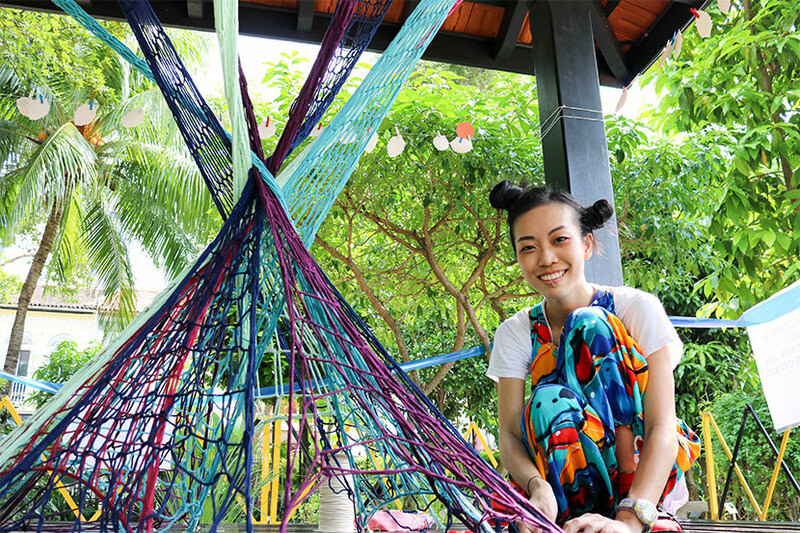 Another yarn bomber, 27-year-old Shu Ning, is part of craft duo Momshoo, a business selling handmade products online and at fairs. She was invited to transform The Substation, Singapore’s first independent contemporary arts Centre in 2014. She developed an interest in the craft after visiting an exhibition focusing on yarn works in Switzerland earlier that year. She was deeply fascinated by how woolly creations could soften up Singapore’s hard city landscape, adding a different tactile dimension to the urban environment. “[It’s] like bringing the interiors to the exteriors!” she quipped. At the Malay Heritage Centre, visitors and staff would stop and gaze at Kelly’s masterpiece, mesmerized by the sudden splash of color added to this historic site.